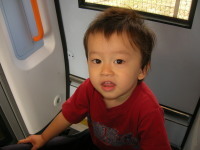 My mum has come to England for a couple of times since Arata was born. But she, and my dad, hadn't visited me at all in the previous 8 years after I started to work here in 1996. To start with, they don't have much interest in the U.K. On top of that, they are usually too busy with their hobbies, and works, before they retired completely 2 years ago. I can understand their reasons but compared to the parents of my friends, my family are different! 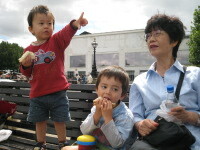 Although the total number of the days mum has spent in the U.K. since Arata was born is quite big, she hasn't gone around to see England much. I decided to take her to London. We arrived at Waterloo and walked alongside river Thames. After having sandwiches by the river, we headed for Bankside, opposite to my work and in front of Tate modern. 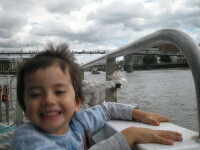 Arata and I got down to the river bank to walk a bit, then got on Thames Clipper to Greenwich. 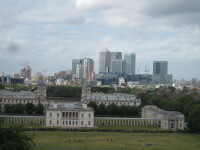 The view from the Observatory hill is spectacular and I always love it.